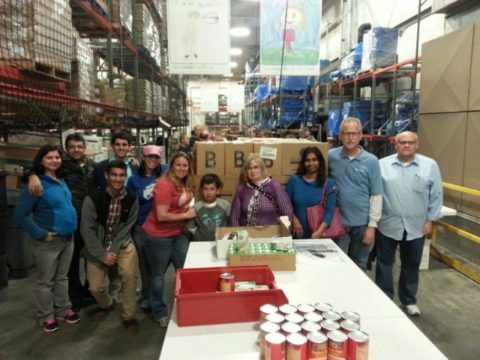 Employees from Terracon’s Corporate office recently volunteered their time to Harvesters, located in Kansas City, Mo. Volunteers put together 1,000 BackSnacks. According the Harvesters website, the BackSnack program provides a weekly backpack filled with nutritious, child-friendly food for schoolchildren to take home over the weekend. More than 100,000 children in Harvesters’ service area receive free and reduced-price school meals during the week, and many of those are at risk of hunger on weekends. BackSnack is a partnership between Harvesters, a participating school and a local community partner-usually a corporate, civic or religious organization. Harvesters provides the food and the backpacks. The local community partners help facilitate picking up the BackSnack food kits from Harvesters and distributing them to the schools. School principals and/or counselors determine which children receive BackSnacks at each school. Harvesters is a regional food bank serving a 26-area county of northwestern Missouri and northeastern Kansas. Harvesters provides food and related household products to more than 620 not-for-profit agencies including emergency food pantries, community kitchens, homeless shelters, children’s homes, and others. They also offer education programs to increase community awareness of hunger and teach about good nutrition. For more information about Harvesters, please visit https://www.harvesters.org/.